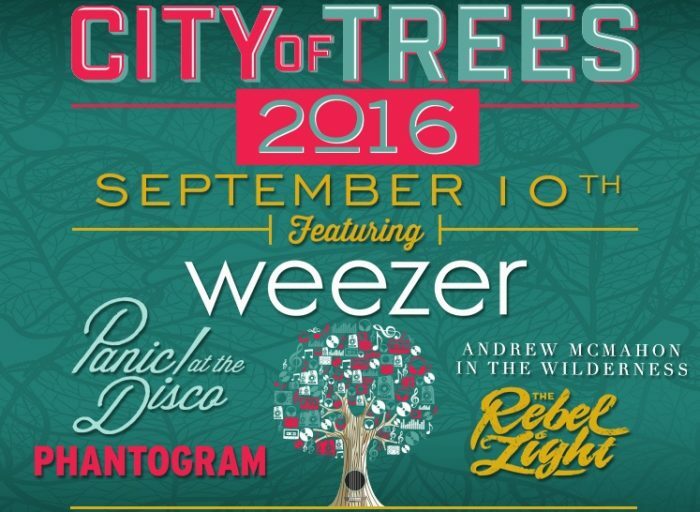 After spending the summer touring together and playing more than 40 different concerts, Panic At The Disco, Weezer, and Andrew McMahon in the Wilderness reunite to headline the 2016 City Of Trees festival in Sacramento, Today September 10. Though summer is long gone, it’s not too late to see Weezer play songs off Weezer’s 1994 self-titled album or catch Panic At The Disco’s Brendon Urie sing tracks off the band’s newest Album Death of A Batchelor. Aside from these legendary headliners, the line-up also includes synth-pop duo Phantogram, glam-rockstars The Struts, L.A. Trio The Rebel Light, and 15 other bands. The outdoor music festival offers two stages and a local music tent featuring Sacramento musicians. The festival started just last year and already had to switch locations due to high attendance rates. This will be the festival’s first year at Bonney Field at Cal Expo, which is located next to Raging Waters Theme park. You can purchase a ticket for $15 and cool off by riding down a waterslide between acts. If you haven’t gotten tickets or just couldn’t make the trip to Sacramento, fear not, we’ve got you covered. Look for live social media updates on our Instagram later today, and review Monday morning.